BRIDGE builds bridges between you and the digital world. BRIDGE has a lot of experience setting up and implementing of digital marketing strategies. These strategies are based on thorough research, a clear strategy, insightful schedule and extended evaluation reports. BRIDGE helps your company get into the digital spotlight. Web surfers become visitors and ultimately visitors become customers. The right SEO strategy ensures a high ranking in search engines. This results in the expected conversion and in many cases it outreaches the expectation. If you want to be assured of prominent positions in search engines and to be found by your target group in an instance, Search Engine Advertising (SEA) is the answer. 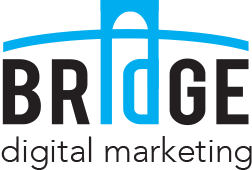 BRIDGE Digital Marketing has the right expertise and tools to achieve your goals! Email marketing is the ideal method to reach a large amount of leads. It does not matter whether it is about 1 or 10,000 leads. But it important to use it in the right way. That is why we talk about dialogue marketing. Dialogue marketing with a relevant and personal approach that will increase (positive) reactions. Do you get the feeling you do not get the desired results from the potential customers who visit your website? Do you want to increase the ROI of the number of leads? Then it is time to use conversion optimization! Conversion optimization is not about getting more visitors to your website, but pursuing greater efficiency from current visitors. It is such a waste when visitors leave your website and did not take anything from it. Remarketing is regaining these visitors. It is also known as retargeting. Remarketing ensures potential customers, who have viewed certain pages of the website, can be accessed again. These are the most qualified visitors. Do you wish to have more knowledge of digital marketing within your company? BRIDGE can help you raise the level of knowledge. We have professionals in-house with a lot of skills and passion for digital marketing. They would like to share their knowledge with you. Affiliate marketing uses third parties to promote your campaigns or website. These third parties, also known as affiliates, are only paid for the actual results. Affiliate marketing is performance driven and not only increases your brand awareness, but also creates more leads and sales. Display marketing uses dynamic IAB banner sizes, rich media ads and video advertising marketing to make your website more appealing to your potential customers in an effective way. Display marketing makes sure you reach your target group with the right message and at the right time. Social media is a great way to reach a lot of people in a short amount of time. By using a good social media strategy, brand awareness increases and people feel more connected to your company. Next to the strategy, Digital marketing agency BRIDGE can also monitor all your social media activities. How do your potential customers navigate through the website? How did the behavior of the visitors affect your sales? Nowadays you need more information than just the number of visitors, to operate successfully on the internet. This is why we use web analytics. BRIDGE digital marketing designs, creates and improves websites. The web development is based on 3 important factors: a beautiful design, inventive online marketing and solid technology. We also ensure you can get started with the website yourself by providing a introduction course and using a Content Management System (CMS).